The thirteenth episode of Concrete Revolutio, “Riots in Shinjuku,” cements Jirou Hitoyoshi’s decision to leave the Superhuman Bureau. If you’re interested, you can buy the introductory theme from Amazon! Buckle your seat belts. A lot went down in this episode! Be warned: there are spoilers below! The Strange Power Risk Management Office has finished their police-commissioned investigation. They hold a press conference to announce their findings: the Japanese and United States governments conspired to experiment on mostly Japanese superhumans; _Antares_ and the medical facility’s basement were filled with over a hundred corpses. Some were as young as seven years old when they died. They say the Superhuman Bureau knew. When government agents try to breakup the meeting and demand Raito Shiba stop them, he points out that the police had hired the Strange Power Risk Management Office in the first place to get to find out what had really happened! The Strange Power Risk Management Office discovered and reported that the government was behind secrete superhuman experiments. Capture from the Funimation stream. The newspaper stories spark protests across the globe. Hyouma Yoshimura, who seems to have taken over the Superhuman Bureau after Claude revealed that Daishi Akita was actually an alien, stresses that the Superhuman Bureau had no idea about the secret labs or superhuman testing. Yoshimura tells Hitoyoshi that he has to apprehend Claude before the new superhuman law is passed in two months. After two months, the Superhuman Bureau still hasn’t found Claude. Mitsuya, a politician whose vote is essential to passing the new superhuman law, berates the Superhuman Bureau for not finding either Claude or “the witch” and demands that both die tonight. As he hangs up the phone, the now gaseous Akita — obviously still alive — expresses disappointment that the politician is in reality no ally of the superhumans. Akita kills him and takes over his body. The student protesters plan to make the train station at Shinjuku their focus, because the US military has been using the rails to ship fuel — and therefore endangering the population. The protests demand two things: halting the fuel shipments and disapproval of the new superhuman bill. Ullr makes contact with Emi Kino and tells her that he hopes that Kikko Hoshino will hook up with Claude. That should bring some balance to the situation. Then he hits on Kino, but unfortunately for him, Hitoyoshi shows up. Together, Kino and Hitoyoshi force Ullr to give them more details about the Devil Queen’s nature and plans, including how she feeds off of human happiness. Ullr says that the Devil Queen became Hoshino’s dominant personality because of Claude’s medicine and hypnosis; and her disappointment in Hitoyoshi. As they drive away, Kino is angry that Hitoyoshi is still fighting to save Hoshino. Kino says that she knows how to submerge the Devil Queen and leave the sweet Hoshino intact. Her condition? That Hitoyoshi never sees her again. He accepts. Kino is not at all happy that Hitoyoshi still wants to save Hoshino. Capture from the Funimation stream. The protests begin. The police know that Claude’s hiding among the protesters. The protesters are prepared: they all put on outfits that look just like Claude’s. The Angel Stars, a superhuman music group, arrives to support the protesters. As the conflict expands, Magotake Hitoyoshi, watching from the rooftops, confesses to Master Ultima that the US military already canceled the fuel shipments. Magotake “leaked” that they shipments continued to gather the students together so they’d be easier to defeat. The riots begin to get more violent as more superhumans, emboldened by the students protesting on their behalf, get involved. Earth-chan arrives and demands everyone stop fighting. Yumihiko Otonashi/The Boys of Light confronts her, saying that students who fight the police should be punished. On another front, Shiba fights a different group of student protesters because he says their antics will snarl traffic for thousands of commuters. Before the fight can escalate, Fuurouta plucks Shiba off the ground because, as a child ghost, he’s a friend of children everywhere — children like the protesters. Shiba can only respond that he saw that as he role, too. For an android, he looks heart-broken. When the protesters reach the spot where the fuel tankers were supposed to be, Yoshimura greets them. The tankers, instead of holding fuel, hold police mechs, which attack the protesters. The protest begin to waver and scatter when one of the mechs seems to turn on the others. Claude’s driving it. He tears Yoshimura’s mech apart just before Hitoyoshi arrives with Equus and engages Claude. They are evenly matched. Watching the battle, Magotake muses that Claude and his helmet, the results of Master Ultima’s sacrifice of “countless” superhumans, wasn’t good enough for Master Ultima. Master Ultima agreed and said that Jirou was his real goal, but Magotake said that Jirou was unique and unprecedented. .
As they fight, Jirou says that superhumans shouldn’t fight humans, they should protect them. Claude counters by asking who protects the superhumans? Certainly not the Superhuman Bureau. Hoshino in Devil Queen mode tries to intervene, but Kino blocks her. Kino’s magic strips the Devil Queen persona from Hoshino, who falls unconscious. Jirou and Claude continue their fight, arguing all the while about how justice, peace, and freedom interrelate. Jirou pursing his justice could constrict Claude’s freedom. Claude concludes there’s no single answer. As Claude beats down Equus, he presses his argument. He says Jirou is naive to think that humans will accept superhuman protection with thanks. Jirou says he wants to at least protect superhumans like the ones he looked up to when he was a child. Claude tells him such a dream is a mirage and can never be achieved. Jirou unleashes his power to defeat Claude. Capture from the Funimation stream. Now, cornered, despite Kino’s warnings, Jirou releases the power in his left arm. Equus, its power now overflowing, demolishes Claude’s mech and damages his helmet. Claude tries to pull himself from the wreckage by absorbing its metal, but with his helmet broken, he can no longer control his powers. He accidentally turns himself into a metal statue. Judas, a superhuman who had fought against Earth-chan but is now on good terms with her (and will help resuscitate her in the future) pulls many different superhumans together to help stop Jirou’s rampage. They manage to pull him from Equus so Kino can reset his arm’s control rods. When the fight’s over, Earth-chan lies inactive on the street. Shortly thereafter, the new superhuman bill fails. Mitsuya. the key politician who had supported it, inexplicably voted no. Jirou briefly confronts him and says the chief will never forgive him. Two other men, also aliens in human form, accost Mitsuya, only to find that he’s really Akita, and that he acted this way because he thought he and his brothers in space might have been too arrogant in their approach. Back at the Superhuman Bureau, Hoshino is sad because Jirou left. Kino confesses to Ullr that her intent had been to drive Hoshino out, not Jirou. The last scene is apparently from the time of Jirou’s birth. 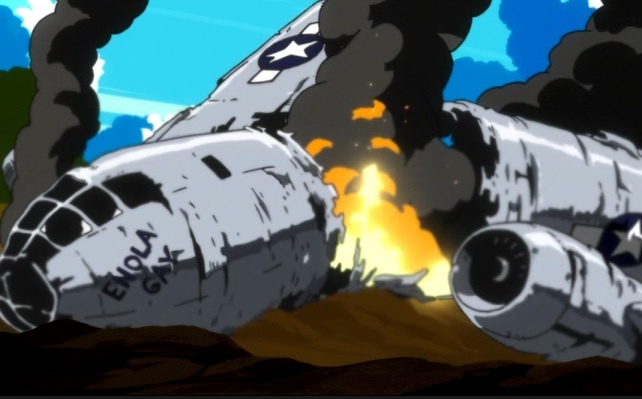 Magotake runs to a crater near the site of the crashed _Enola Gay_. At the bottom of the crater is a crying pink-haired child — the baby Jirou. Touching baby Jirou was a point of purple-colored rock or dirt, very different from the surrounding crater wall. Magotake is astonished to realize that the coloring, viewed from above, forms the outline of a dragon or other huge beast. Well, that was unexpected! Capture from the Funimation stream. It appears that we’ll get to see a second season starting in April 2016. The intricacy of the plots that came together in this episode impressed me. We got to see characters like Judas and Earth-chan’s arcs come to fruition. They even acted as if they’d been affected by what happened to them before (What? Character development? Cool!). The subplots of superhuman experimentation and government secrecy were front and center. In a way, the government was the victim of its own success, since Claude seemed to be the pinnacle of their achievement, and he led the uprising. We got to see many of the superhumans we met earlier, having made their decisions about allegiance during their earlier experiences, join sides. Loyalties clash all over the place in this episode, to dramatic effect.Yoshimura and Magotake were clearly on the side of the government; so was Yoshimura. Kino tried to preserve her relationship with Jirou. Fuurouta stayed loyal to his child/ghost nature and attacked Shiba. Jirou ended up leaving the Superhuman Bureau because he wanted to stay loyal to his concept of justice. Even Akita stayed loyal to his mission to help the superhumans in his own way, and that seemed to conflict with his loyalty to his own people. Lots of examples of clashing loyalties in this episode. We also confirmed just how vicious Kino could be. 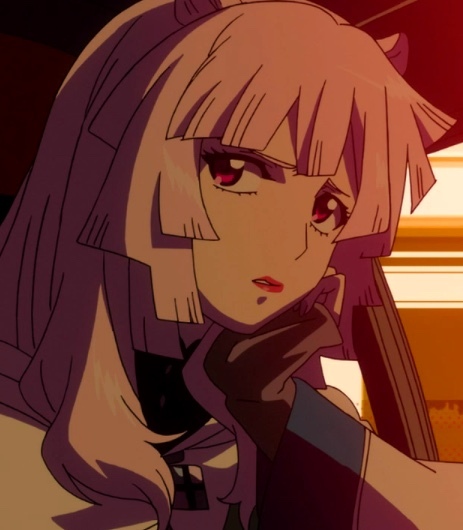 As she’s casting out the Devil Queen persona, she tells Hoshino, “I wish I could just kill you here, but I promised.” Kino’s clearly poised and capable of defending her claim to Jirou. Please remind me never to make her angry! 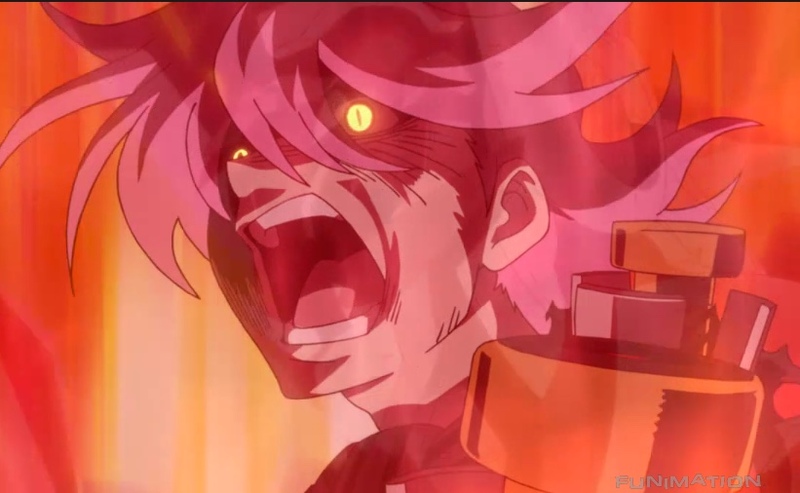 It’s not Concrete Revolutio’s fault, but I walked away from this episode depressed. The animation was great, the plot plunged towards an emotional climax, and the characters were fantastic. Why depressed, then? Because Concrete Revolutio is almost too realistic in terms of its political themes. It’s impossible for me to use this show as a mindless escape from the world! On the other hand, maybe that’s really a good thing. If this is the fate of a superhuman who challenges the power, what can a “normal” human accomplish? Capture from the Funimation stream. In spite of the show’s sometimes extremely abstract imagery (just what are those runnings hands during the ED, anyway? ), the show presented starkly realistic depictions of politics. While we never saw government officials debating policy or issuing orders, we didn’t have to: we saw the results. We saw the Rainbow Knight framed for a kidnapping he didn’t commit, just so those in power could create the conditions for an instrument of their will (the Superhuman Bureau). Anyone remember the claim of Weapons of Mass Destruction in the run-up to the Iraq War? We saw the results of secret government experimentation on superhumans in the hull of the _Antares_. This reminds me strongly of the United States military conducting nerve gas experiments on its own soldiers. With those kinds of power exercises as a backdrop, Concrete Revolutio asks how individuals, even superhumans, can affect the trajectory of human affairs? How can anyone fight for justice, or peace, or freedom when such dreadful power thwarts them? Worse, how can they even begin the conflict if no one can agree what justice, peace, or freedom mean? The show really doesn’t provide any answers, and I think that’s okay. Art’s job is to provoke the questions so we (living as we do in real life — that’s where we live, right?) can ponder and act on them. That’s our responsibility as citizens of the world! Of course, I say that bravely, but I have no idea how to actually affect change. Guess I better keep thinking about it.